It’s normal for dogs to sleep through the night, and many dogs also spend much of the day asleep. While we humans are used to the idea of sleeping when it’s dark out, we find it a bit odd how much our dogs sleep during the day. Why do dogs sleep so much, anyway? According to experts at the National Sleep Foundation, it’s normal for dogs to spend about 50% of their day asleep. Another 30% of the day is spent “resting,” while dogs are active just about 20% of the day. This is pretty normal for carnivores—lions also famously spend 18 or more hours per day sleeping and resting! Most dogs will sleep whenever there isn’t anything better to do. Since they don’t have smartphones, jobs, or homework, sleeping is generally the best way to spend long, boring hours. 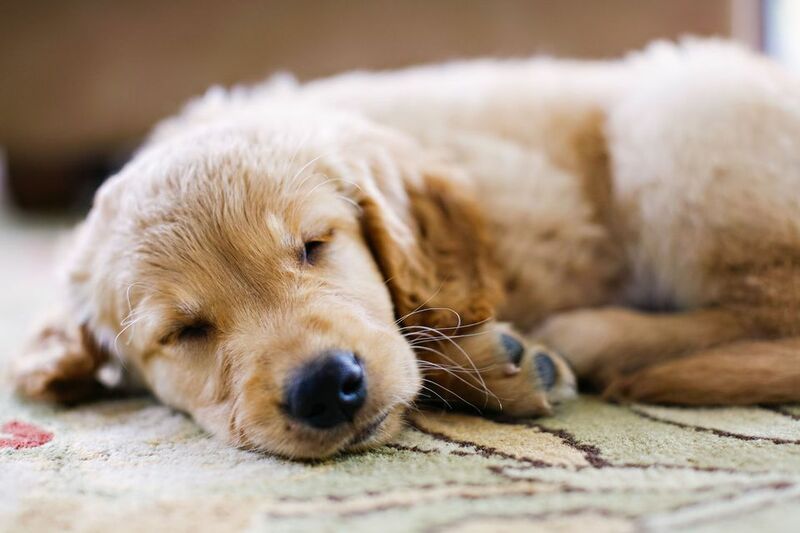 Puppies and older dogs will likely spend more of their time asleep. Overweight and sick dogs may also sleep more than healthy dogs. Certain breeds are predisposed towards sleeping more (just ask someone who’s owned both a lazy Bernese Mountain Dog and a working-line Border Collie). Of course, hours and hours of snoozing can also be a sign of a problem. Many diseases and age-related problems can come with a change in sleeping patterns. Stress and separation anxiety can also manifest in extra daytime snoozing. In most cases, a dog that sleeps for 12 or more hours per day is no cause for concern. That’s just normal! But owners should be aware that excess sleep can also be a sign of potential problems, and it's best to talk to your vet when you have these concerns. Since most dogs don’t go to work or school, it’s common for them to be bored and alone all day. Pair a long, lonely day with the hours that their human is asleep, and that’s a long time for your dog to spend sleeping every day! If it feels like your dog is sleeping his life away, consider what else he’s got to do with his time. The best way to help your dog stay awake and active during the day is using puzzle toys. Ranging from the super-easy (rolling treats inside of a towel or an egg carton) to the high-tech (the CleverPet), puzzle toys help keep your dog active during the day. Checking in on your dog using a dog camera can help you check to see if she’s playing with the puzzle toys or ignoring them. You can also spice up your dog’s day with midday dog walks and longer bouts of exercise in the morning and evening. If you notice that your dog is sleeping even when there’s something better to do, it might be time to get help. Generally, it’s pretty normal for your dog to spend most of his day asleep or resting. That said, too much sleep can still be a sign of problems with your dog’s health. Your dog’s sleep patterns have changed. Your dog sleeps even when there’s “something better to do,” especially if that thing would normally grab her attention. Your dog’s sleeping is interfering with eating or drinking. It’s hard to rouse your dog in the morning. Your dog falls asleep suddenly, even in the middle of play (narcolepsy). Your dog wakes up suddenly or in a state of fright or stress. Unwillingness to walk, run, or jump. An increase or decrease in eating, urination, or defecation. Staring at corners or walls. An increase in aggression or fearfulness. Pacing, drooling, and other signs of anxiety. Some of these signs might not be so scary if your dog is otherwise aging with grace, especially if she’s always been a bit on the lazy side. But it never hurts to go in and ask the vet about it. Your vet will likely have a lot of questions and may need to run some tests. Even if you’ve got a detailed log of your dog’s sleep and her other symptoms, nailing down the problem may be tricky. Don’t let that discourage you. Drowsy dogs may actually be suffering from hypothyroidism, back pain, diabetes, anxiety, or many other serious ailments. Getting a thorough work-up from your vet, which may include blood work and other tests, is the only way to know for sure. Try to keep track of your dog’s sleep patterns and other symptoms. Make sure she’s a healthy weight and that she has plenty to do during the day. If she’s still sleeping an unusual amount, it might be time to go see the vet.